For the motorcycle riders the world over, Ladakh remains a challenging, yet beautiful journey that needs to be undertaken at least once in the lifetime. 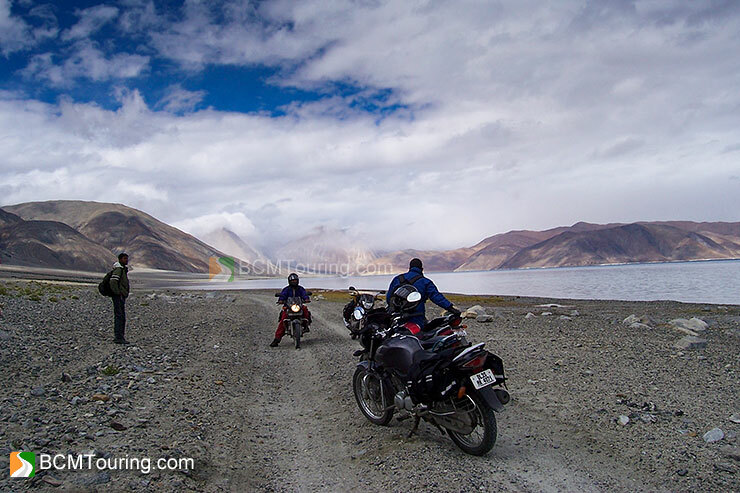 However preparing your motorcycle for such an arduous journey is a task in itself and if done correctly, goes a long way in ensuring that you have a relatively hassle free ride to Ladakh. And this How-to article will help you do just that! Clutch Plates: It is essential to have clutch plates in good condition, before starting a ride to Ladakh; otherwise you can end up with a motorcycle, which refuses to climb steep hilly roads Ladakh has to offer. So make sure to get your clutch plates check and replace them, if they have little life left in them. Piston Rings: If your bike has been consuming engine oil lately; it is best to get the piston-cylinder kit checked for wear and tear and replace them if necessary. Also get the valves checked as well. Timing Chain: Another thing you need to pay close attention to is a loose/worn out timing chain, which can end up causing mechanical failure during the ride or make your motorcycle perform sub optimally. Drive Chain & Sprockets: Check drive chain and sprockets for wear, if the chain and/or sprockets are on the last lease of life, change the entire chain-sprocket set. Else get them cleaned and lubricated. Suspensions: Riding on the harsh terrain of Ladakh with a bike loaded with rider and luggage can take a toll on the suspension of your motorcycle. Get the front and rear suspension checked, and if the need be, get them repaired/changed. Swing arm bush: Get the swing arm bush checked for slackness, change if needed. Air filter/spark plug: If your air filter and/or spark plug is over 10000kms old or approaching that figure, get them changed. Don’t throw the old ones out, keep them as spares. Clutch & Accelerator wires: If your Clutch and Accelerator wires are over 10000kms old, get them changed and keep the old ones as spare. If they are not in need of a change then get them lubricated. Brake shoes/pads: Get the brake pads and shoes checked for wear, if they can’t last for 5000kms, get them changed. Also get the brake fluid changed or top it up, if you had changed it recently. Con Set: Con set is an essential part of the bike and if it’s loose or worn out, it can affect the handling of the motorcycle. At the time of service get it checked and change it if the need be. Engine oil/filter: If the engine oil is over 500kms old, get it changed. Also change the oil filter. In case your bike uses an oil strainer, get it cleaned. Electrical and battery: Get all the electrical wiring checked, check all bulbs to see if they are functioning properly. Also clean the headlight seal beam and brake light to ensure better visibility. Also make sure your bike’s battery is performing well, this is especially important if your motorcycle does not have kick start. Fasten all nuts and bolts: Get all the nuts and bolts fastened properly, in case any is missing, get it installed. Carburetor Tuning: Keep the Carburetor tuning as close to stock as possible. Running it rich will cause problem in high altitude areas and running it lean would lead to overheating in plains. General check: Give everything a once over, ensure that everything is working properly and all the fluids are topped up, i.e. battery water, engine oil etc. Ensure all fuel lines are intact and there is no leakage anywhere. Tyres: Check both tyres for wear and signs of cuts and cracks. If either of them is nearing the end of their life, get them changed. If you need to change tyres, get dual purpose tyres, since they perform well on and off road. Wheel alignment: In case your motorcycle has spoke wheels, get them checked, and if the need be, get them aligned before your ride. If you have gone through the above routine, your bike should hold through for the entire trip, but it’s a good idea to ask your motorcycle mechanic to teach you minor chores like tightening rear brakes, adjusting clutch and accelerator play, adjusting chain, fixing puncture, replacing bulbs and changing accelerator/clutch cable/levers. Now that you have prepared your motorcycle for Ladakh, and are ready to start your ride, there are a few checks you need to perform daily. Double check fluid levels such as engine oil, brake oil and coolant (in case of liquid cooled motorcycles). Check tyres for air pressure as well as look for any signs of puncture or damage. Check if chain is lubricated properly and isn’t too tight or too loose. Although it is recommended to learn basic repair of your motorcycle, even if you don’t know much, it is generally a good idea to carry necessary tools and spares. Since sometime even in the smallest of town, you can find a mechanic or someone who knows how to do basic repairs, but might not have the required tool or spares to go through it. In case you wish to carry less gear, then check out our Essentials for a Motorcycle Ride to Ladakh. 1. Tool kit: OEM tool kit that comes with motorcycle is an essential part of the tool kit that every tourer should carry. 2. Ring spanners size 8 to 17: Should come in handy for tightening nuts and bolts of various sizes. 3. Screw Driver set: Try to carry a screwdriver set which has multiple attachments; a set which also includes a set of Allen keys is a good choice. While purchasing screwdriver set, ensure you get one which is sturdiest of the lot and won’t break while you are tightening or opening something. 4. Steel wire: Can be used to tie together bike parts in case of any breakage. 5. Electrical & Scotch tape: Can be used for tying together various parts and insulating damaged wires. 6. Torch light: In case of break down in the evening or early in the morning you will need it to see your bike, even once you are off your bike it can prove quite useful. 7. Foot or Electric air pump: Since motorcyclists don’t have the luxury of carrying a spare tyre, an electric or foot pump combined with a puncture repair kit and spare tube can turn out to be a life saver. 8. Puncture repair kit: Puncture repair kit for tyres with tubes should consist of; rubber patches, solution for pasting the patches on tube and tyre iron for taking off the tyre from the rim. In case of tubeless tyres, purchase a tubeless puncture repair kit. 1. Engine oil: Carry at least half a liter of engine oil recommended by your motorcycle manufacturer, daily check engine oil level and top up if necessary. 2. 90w Gear oil: Can be used to lubricate drive chain, in case you prefer to use WD 40 or chain spray, please carry that. 3. Headlight and brake light bulb: Always carry spare headlight and brake light bulb. 4. Chain links: Carry couple of chain links, in case your drive chain breaks due to something, you can fix it and ride on. 5. Clutch and front brake lever: In case of a fall clutch/front brake lever can break, which can make riding motorcycle difficult. Hence it is best to carry each of these as spare, to ensure you can ride with ease. 6. Clutch and accelerator wires: Clutch and Accelerator wires have a habit of snapping in the middle of nowhere, so please carry a spare clutch and accelerator wire. 7. Spare tube for front and rear tyre: Carrying a spare tube for both the tyres will ensure that in case of a puncture you wouldn’t have to waste your time trying to repair the punctured tube and can simply change the tube and continue riding. In case your motorcycle has tubeless tyre, carrying a spare tube is still a good idea, since it can help you ride your motorcycle, even if the rim bends a little, causing air to escape from tubeless tyre. 8. Spark plug: Although spark plugs of modern motorcycles rarely give problem, it is a good idea to carry a spare one. 9. Spare key of your motorcycle: Always carry a spare key of your motorcycle and never put both the keys in the same place! 10. Spare Fuse: A blown fuse can leave your motorcycle without headlight and/or horn, so don’t forget to carry one with you. 11. WD40: Can be used to lubricate and clean various mechanical and electrical parts of the motorcycle. 12. Nylon Rope: Can be used for tying together various parts of your motorcycle or to help you tow your friend’s motorcycle or help someone else tow yours. 13. Bungee cords: Helps in tying the luggage, always carry couple of spare ones since they can snap under pressure. 14. Electrical wire: Can be used to replace faulty electrical wire in the wiring. 15. Few nuts and bolts of various sizes: Based on your motorcycles make, carry nuts and bolts which hold parts like exhaust, leg guard, foot pegs etc. 16. Petrol pipe: If you run out of petrol and come across someone who is willing to lend some petrol to you, you will need it to take petrol out of their petrol tank. 17. Coolant: If your motorcycle is liquid cooled, make sure to carry little bit of coolant with you. If you own a CI Engine Royal Enfield Bullet, also carry 250ml clutch oil and a decompressor cable. In case any of your motorcycles parts have a history of ditching you in the middle of nowhere, it would be a good idea to carry it as spare. In case you have any queries about preparing your motorcycle for Ladakh, please post a message here. Any one planning Delhi – Leh – Delhi trip end of july? Hi, I am planning Mandi (HP)-Leh-Mandi from 19 July to 2 August. I am alone and looking for a biker mate. Satyajit, you can find bikers in our Travel Partner section. We are group of 5 ppl going from August 8th till August 17th… If intrested you can join us..
i have 2 bikes . both r 2012 model & less than 10000 kms and in good condition . which one is better for jammu-leh-manali-chandigarh-manali trip. but yamha have starting problem in cool temperature also. If you are having starting issue with Fazer, then take the Discover. Just make sure to carry as less luggage as possible and you should be fine. My bike is is registered on my relatives name. ( female). Is there will be any problem to get inner line permits from manali or leh or anywhere. hi yogesh we 6 friends are planning have bike ride from chandigarh – leh – manali – chandigarh.. from 8th aug to 18th please suggest the best way..
Shrikant, in the following link you can find the list of essential things to carry on the ride (including cloths etc.) http://www.bcmtouring.com/forum/articles-f20/essentials-motorcycle-ride-ladakh-t52336/. Hi, Myself Kunal and my mate Harish are starting our trip from Coimbatore to ladakh on 28th august, a 24days trip. We are a group of 3-4 currently, travelling from Chandigarh to Leh. We reach Delhi morning on 23rd Aug, From their a Taxi to Chandigarh..Pick up the Bikes that land there from Bangalore via Train!. Plan is to start riding from Chandigarh from 23rd Aug and return by 31st as our Flight from Delhi back to Bangalore on 1st Sep!. Do let us know if anyone else is riding from Chandigarh during the same time. Any past riding experiences also are welcome!. So, Anybody can ride on his 110cc machine safely through the mountains of Ladakh. Im planning to travel from Bangalore to Amritsar on My Pulsar 200 NS. How much cash am i supposed to carry which includes fuel & food. One of the most important things to keep in mind is rightful riding. Don’t ride on half clutch in the hills as it will destroy your clutch plates. Keep clutch disengaged as much as possible. @amit,i am impressed with your ride. You not only completed your ride successfully on a small capacity bike, but also did it in true biker style. Carrying tents and cooking gas along. I am really inclined to imitate you. I have a bullet 500. Guess i will do a double, and carry all the stuff for a true blue experience. I am planning a Leh Laddakh ride starting first week of june 2015, for 15 days. I did a lahaul-spiti ride in August 2014. IM LEAVING ON 1ST AUGUST TO 12 AUGUST FOR LEH .IM DOING A SOLO RIDE IF ANY ONE INTERESTED TO JOIN ME CAN CONTACT VIA EMAIL. Need some advice and suggestions. Me along with my friends are planning a road trip to Leh Ladakh this year, I guess the best time is June July and accordingly we have planned. Since we are planning to go on a road trip, we are planning to take bikes on rent from Manali, can anyone suggest where we can get the bikes from manali at the best deal. And since I am RE rider, I would prefer a RE but please suggest is it the best option for the mountains or we should take up other bikes. Also please suggest do we need to put on riding gears like BODY ARMOR, KNEE & ELBOW GUARD apart from mandatory HELMET and GLOVES. Also please suggest if there are locations where we can put up our own tents which we are planning to carry along with us. Awaiting for your valuable advises and suggestions. One can join easily from Delhi. also carry a postpaid sim card of airtel or bsnl because pre paid sim cards which are registered outside j&k will not work here….or u can use a pre paid sim card of jammu registration. You can travel on one motorcycle, as long as the motorcycle is in good condition. Is anyone in manali heading to leh tomorrow??? Planning for ladakh on bullets for june 2017. We are three with own bikes. Delhi-leh-delhi. hi.its ankit here from raipur CG.im coming on 8th night to jammu.solo.would do srngr leh everythng in between and to delhi.Anybody wants company can whatsapp on 8871303175. I have Pulsar 180cc DTSI 2007 model. I have drove 70000km. Can I take it to Delhi To Leh-Ladakh. If Any one ever visited with pulsar please share your views, It will be very help full for me. We have decided to start our journey on 10th of July 2017. I have taken my Pulsar 180 2002 model, thrice to Ladakh, once each to Spiti and Sach Pass. As long as your motorcycle is in good condition and you follow this guide, you should be able to do the trip without much issue. Rented bikes from Delhi are allowed to go to nubra valley/Pangong/Tso Morriri? I knew rented cars from Delhi are not allowed. Regarding bikes – I am getting mixed answers, Could you please clarify us? RC needs to be in your name or that of your close family members. Else for Nubra and Pangong, you will have to hire motorcycle from Leh. Yogesh, we group of 6-8 friends with two person on each bike. As understand from above conversation Enfield, Pulser and Frezer will do. We all have vehicle of our friends with RC on their names. Does it create problem ?Any kind of prior approval is required for Leh-Laddakh trip? What documents required to carry with us? If the motorcycles aren’t in your name or that of your family members. You will have to park them in Leh and hire motorcycles or taxi from there, in order to visit Khardung La, Nubra Valley and Pangong Tso. Am planned a leh trip on next season .but the main problem is my bike is on the name of my friend.can I go with that? You can. However for Nubra and Pangong, you will have to hire motorcycle from Leh. Can we take any of our relatives or friends bike to the Leh tour. What documents are required in that case. I do understand our bike is a better option but just want to know just in case required. As long as the bike belongs to your mom/dad/real brother/real sister, you should be fine. Otherwise you will have to leave the motorcycle in Leh and hire a motorcycle from Leh in order to visit Khardung La, Nubra and Pangong Tso. Mr Gaur: 8692076869 / 9987771013. Above Dates : 30th May — 9th June 2018.